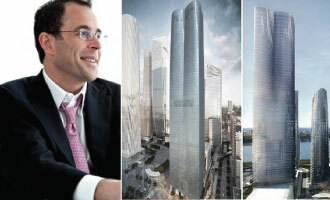 The Related Companies is seeking a $1.74 billion sellout at 15 Hudson Yards, one of the largest condominiums hauls ever recorded in New York City. The New York state Attorney General’s office approved Related’s condo offering plan June 2, meaning the building is now able to launch sales. The 88-story tower is slated to have 285 market-rate condos and 106 affordable units. The condo with the priciest sellout currently on the market is Vornado Realty Trust’s 220 Central Park South, with a projected sellout of $3.1 billion. “We have already experienced a tremendous level of interest,” she said. The tower is financed in part by the Children’s Investment Fund, a United Kingdom-based hedge fund that’s bankrolled the construction of supertall condos for the likes of Harry Macklowe at 432 Park Avenue and Larry Silverstein at 30 Park Place. The fund ponied up $850 million in construction financing for the condo portion of the project. Construction began on the building in late 2014 and is expected to be completed later this year. It’s the first residential building to go up as part of Related’s massive mixed-use Hudson Yards development. The first commercial building, 10 Hudson Yards, debuted in May.